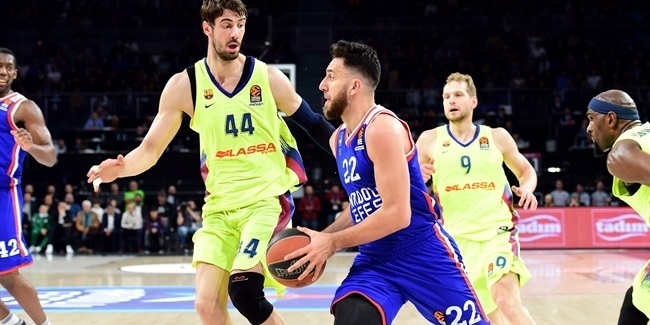 Rudy Fernandez showed why he has been named to the All-Euroleague First Team for two years running on Thursday when he put together one of his best performances in leading Real Madrid to a convincing 97-73 victory over archrival FC Barcelona in the Game of the Week. The victory kept Madrid tied for first place in Group E and his stellar game earned Fernandez the Top 16 Round 6 bwin MVP honor. Fernandez torched Barcelona for 22 points on 6-of-7 two-point shooting, 9 rebounds, 5 assists and 3 steals for a performance index rating of 38. The index rating was both his career high and the highest by any player in the Top 16 this season. 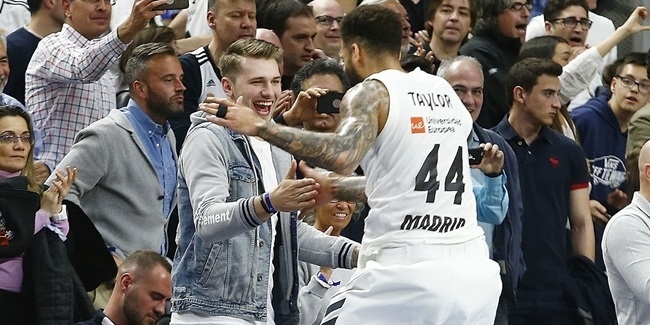 The former Euroleague Rising Star Award winner helped his team blast off early with 3 three-pointers and 11 points in the first quarter as Madrid took a double-digit lead and never looked back. This marks Fernandez’s seventh weekly MVP honor and his first this season. Boban Marjanovic’s dominant season continued as he posted the second-highest index rating of Top 16 Round 6 with 35 in Crvena Zvezda Telekom Belgrade’s 68-70 home loss to Zalgiris Kaunas. This marked the third this season that Marjanovic has had an index rating of at least 35. Marjanovic amassed his league-leading ninth double-double of the season with 17 points on 6-of-7 shooting, 10 rebounds and 2 assists. Jayson Granger was the hero as Unicaja got its first Top 16 victory by 85-76 over visiting Nizhny Novgorod. He scored a career-high 29 points in addition to 5 assists for an index rating of 34, which also marked his career best. 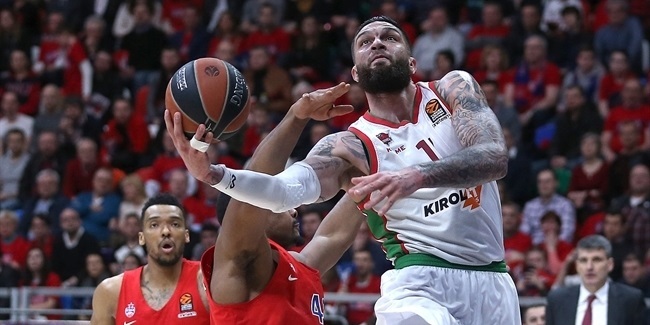 Rounding out the week’s top performances were Zoran Erceg of Galatasaray Liv Hospital Istanbul and Trey Thompkins of Nizhny, each with 33 indexes. Erceg peppered the nets for 29 points in a 94-97 overtime loss to reigning champion Maccabi Electra Tel Aviv. Erceg also had 7 rebounds, 3 steals and drew 10 fouls. Thompkins compiled 27 points and 13 rebounds in a losing effort in Malaga. Granger and Erceg’s 29-point efforts this week were also the highest in the Top 16 so far this season. Taylor Rochestie of Nizhny continues leading all Top 16 scorers with 19.7 points on average and the full-season rankings with 19.9. Nemanja Bjelica’s 15 rebounds were not only the most of the round, but also made him the Top 16’s leader with 10.7 per game. Marjanovic remains the season-long rebounding leader with an average of 9.9. Marcus Williams of Zvezda had 7 assists to lead all passers this week. Rochestie's 7.3 on average is best in the Top 16, while Milos Teodosic of CSKA Moscow has the same 7.3 atop the full-season leaders. Williams joined Fran Vazquez of Unicaja as the week's top stealers, with 4 each. Fernandez leads the Top 16 with 2.3 per game in that department, while the full-season leader is David Logan of Dinamo Sassari. Arturas Gudaitis and Robertas Javtokas of Zalgiris Kaunas, as well as Artsiom Parakhouski of Nizhny, were Last 32 Round 6's best shot blockers, with 3 each. Parakhouski's 2.7 per game leads the Top 16 and his 2.1 the full-season rankings. Marjanovic, Bjelica (14 points, 15 rebounds) and Trey Thompkins of Nizhny (27 points, 13 rebounds) were the only three players to register double-doubles this week.